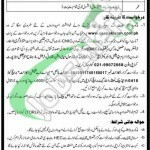 If you are waiting for Jobs in CAA Pakistan we provide here CAA Pakistan Jobs Mar / Apr 2016 Online Application Form www.caapakistan.com.pk. Jobs in CAA Pakistan Civil Aviation Authority are available and it is seeking for highly educated, very experienced, hardworking and well disciplined candidates for the following position such as (Senior Intelligence Superintendent). Appointment of above mentioned 12 positions will be done on purely contract basis and duration of contract will be two years which is extendable on satisfactory performance. Candidates from all over Pakistan can apply for these posts but they have to read following eligibility criteria carefully such as interested candidates should possess minimum 2nd Division Intermediate or equivalent degree and have maximum experience in the relevant field. It is golden opportunity for you have job in such type of department because now against this post CAA will offer Rs. 75, 199/- per month salary. For interested and eligible candidates we have provided complete how to apply procedure in the very next heading. Fill carefully online application form and take print of it and submit it along with two recent passport size photographs, attested copies of educational certificate, diplomas, CNIC, Domiciled and other relevant documents on the following address given below. Candidates have to attach with application form an original deposit slip of Rs. 600/- in favor of HQ CAA, Karachi which is non-refundable. Last Date to Apply: 11th April, 2016.